On the wall of Cindy Parseghian's office hangs a giant bulletin board--a tribute to four children from a mother who once wasn't sure she wanted kids. There are photos of Michael, Christa and Marcia in their karate uniforms, Ara at a high school dance. Greeting cards filled with quotes about faith and will, a napkin with a scribbled message: "Love U More." Scattered through this precious window into a family's yesterdays are the annual Christmas cards, always decorated with a photo of the children and always signed "The Parseghian Family." Christmas 1996: A studio portrait of four kids, snuggled close and smiling big. 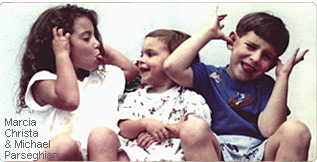 Christmas 1998: Ara and his two sisters, one on each side planting a kiss on his cheeks. Christmas 2000: Ara and the girls huddled around a tree, Christa on big brother's lap. Cindy Parseghian smiles with pride as her eyes move across each photo, each note, each memory. But the cards stop her, and her smile fades. "We're not doing a card this year," she mumbles. "It's just too empty." Then it hits. There, scattered among the cards, are the obituaries. Michael, March 26, 1987-March 22, 1997: "He loved karate and cowboys and Garth." Christa, April 12, 1991-October 23, 2001: "If love is for always, then she is Christa." The year 2001 brought so much heartache to so many, and it brought fresh misery to Cindy and Mike Parseghian, son of legendary Notre Dame football coach Ara Parseghian. They lost a second child to Niemann-Pick Type C disease, while another is deteriorating. How does a couple survive three of their four children being stricken by a neurological disorder that eats away their bodies, transforming them into invalids fed from tubes and incapable of speaking? How do you go on with life when you are surrounded by impending death? Yet from the children's abbreviated lives, the Parseghians have found joy amid the agony, scientists have gleaned inspiration, and strangers have been moved to open their hearts and give. It is an odd turn of events for two people who were going to be professionals, not parents. In 1981, at 26, Cindy Parseghian had her master's in business administration and had been accepted into law school at Northwestern. Mike, then her husband of four years, was applying for medical residencies with the goal of becoming an orthopedic surgeon. When Mike took an opening at Arizona instead of Northwestern, Cindy's plans for law school changed. So, eventually, did her thoughts on parenthood. Three years later she gave birth to her first child, Ara, and Cindy knew immediately that she wanted more. Three more, to be precise. "I was just really overtaken with motherhood," she recalls. "There's a connection with your child like none other in the world. You feel this beating soul inside you, and it never leaves you." 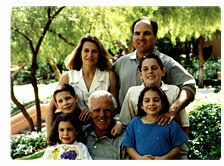 With their dark hair and dark eyes, a mark of Mike's Armenian heritage, the Parseghian kids were a striking bunch. They had beauty, brains and spirit. Ara and Michael, born three years later, took an early interest in karate. Marcia, a year and half behind Michael, began reading at 4 and was the first in dance class to skip and tie her shoes. She was so smart, so tenacious, Cindy dreamed of one day sending her to Stanford. Christa, the baby, was everyone's little angel. With her cascading tresses and dimpled smile, she was as adorable as a young Shirley Temple. She even loved to tap dance. "I felt incredibly lucky," Cindy says. "We had these four beautiful children, and our goal was to raise them to be happy, loving, caring adults. I thought we were on top of the world." Then their world collapsed. They first saw the signs when Michael was in kindergarten. He couldn't handle the monkey bars as well as other kids, and he was losing his balance in karate class. His handwriting wasn't as legible. Cindy took him to a pediatrician, who dismissed the symptoms as childhood clumsiness, and her concern as a mother's overprotection. She and Mike knocked on more doors. An opthalmologist noticed Michael couldn't raise his eyes without also raising his head. He was sent to Columbia for another evaluation. "They took about a five-minute look at Michael and said, 'We think it's Niemann-Pick Type C,'" says Cindy, who remembers they cited two telltale symptoms: The eye movement and the fact that Michael had an enlarged spleen. When Cindy and Mike heard the second symptom they knew: Not one, but three of their children might be dying. Marcia and Christa also had enlarged spleens; doctors had thought it ran in the family. In the summer of 1994, all four children were tested. All but Ara had the disease. Michael was 7, Marcia 6 and Christa was just 3. Niemann Pick Type C is an inherited disorder in which a variety of substances fail to move around properly inside cells, especially nerve cells in the brain. This improper distribution signals the brain cells to die. At first, children seem clumsy. Then they have trouble speaking and writing. As the disease progresses, most have seizures and suffer from a condition that causes them to collapse if they laugh too hard. "There's a point where they cannot walk without assistance. They soon are not able to walk even with help. Feeding tubes will have to be applied," says Dr. Sherman Garver, an NP-C researcher at the University of Arizona. There is no cure. Most NP-C children will die before age 15. The elder Ara Parseghian, who won two national championships at Notre Dame as coach from 1964-75, has seen his grandchildren's decline during visits over Christmas and spring break. "It's very hard," he says. "You envision Marcia and Christa going to their first prom and being dressed for their dates, and ultimately being married and having children. But it's not going to happen." Cindy says: "You scream and you yell and you cry and you curse God. I can't imagine anyone doing anything different." But the Parseghians did do something different: They turned their children's death sentence into a celebration of life. And they let their children show them the way. "Our first response was: Let's take them out of school. Let's show them the world," Cindy says. "Then we realized, that was not what they want. They wanted to be treated like other children, so we tried to make their lives as normal as possible. "They had their own little hopes and dreams, and we tried to focus on those." The children remained in school-always the regular class, even though their learning curve slowed. They continued karate and dance, with assistance from their teachers and fellow students. When Marcia couldn't keep up with her peers in ballet, she joined her little sister's class. She still takes lessons, with a friend holding her up as she dances. As their children lived life, Cindy and Mike searched for a cure. Using her father-in-law's name, her husband's medical connections and her business acumen, Cindy had the Ara Parseghian Medical Research Foundation operating two months after the children were diagnosed. Before the Parseghian Foundation, two labs were dedicated to NP-C research. Today, there are more than 20, and the foundation raises more than $2 million a year toward the effort. "They single-handedly have pushed this whole field," says Dr. Michael Parmacek, chief of cardiology at the University of Pennsylvania, who heads the Foundation's Scientific Advisory Board. In 1997, scientists identified the gene responsible for causing NP-C, but advances have been slow because the gene's function was more complicated than researchers anticipated. Until they know more, a cure will remain elusive. "There was a real hope and a real belief that we could find something that could stem some of the horrible symptoms and give us enough time to come up with a cure," Mike says. "The cure is still obtainable. Unfortunately, it has taken longer than we ever hoped." Too long, they now know, for their children. Michael died of a seizure on March 22, 1997, four days before his 10th birthday. His death stunned the family; he had just started using a wheelchair, and his speech, while slow, could still be understood. That Christmas, Marcia asked Cindy to read her a book about what children want to be when they grow up. Afterward, Marcia said: "I don't think I'm gonna grow up," and she started to cry. When Christa took a turn for the worse this summer, the family prepared themselves-and Marcia. In July, Christa suffered two seizures within five minutes. She stopped eating, and doctors inserted a feeding tube. By fall, the 10-year-old needed a wheelchair full time. In October, she contracted pneumonia. The Friday before she died, Christa spoke her last word. Cindy had told her "I love. . .," and Christa put her hand on her mommy's chest and replied "you." When they knew there was little time left, Cindy and Mike put Christa in their bed; Cindy painted her nails purple, Christa's favorite color, and Marcia went in to see her sister. She sat on the bed, held her hand and kissed her. And when she died, Cindy says Marcia saw "there were a lot of people around, and it was a restful death." On November 21, a month after Christa died, Marcia turned 13. She lost her speech two years ago. These days, she gives a thumbs up or thumbs down to signal her likes and dislikes. She uses a wheelchair at school, although she can walk at home with assistance. One thing is sure, says Cindy: "She very much understands that she has the disease that took the life of her brother and sister." A year after Michael died, he came to Cindy in a dream. He gave her a big hug, and then was gone. "I remember waking up and having this wonderful feeling that my children will always be a part of me," she says. "I feel lucky that I spent so much time with my children. I'm sure more time than I would have had they been normal. We have had a lot of great moments together." The Parseghians don't dwell on the what-ifs: What if they hadn't fallen in love with someone who carried the same defective gene? What if they'd never had children? What if they'd found a cure in time? Instead, they think of the smiles and laughs and recitals and vacations-of all those great moments Cindy has captured on the bulletin board in her office. They focus on Marcia and Ara, a high school senior who hopes to be a writer, or perhaps, like his father, a doctor. And sometimes, they remember the lyrics to a Garth Brooks song their son Michael so loved. At those times, the what-ifs all wash away. "The way it all would end, the way it all would go. "Our lives are better left to chance. "I could have missed the pain, but I'd have had to miss the dance." That, they wouldn't have missed for the world.